DieterVerhofstadt, 1 Dan, playing BlueWyvern in the context of Blue Wyverns/Research Games. Some comments before starting. After seven years of playing, I radically changed my playing attitude. I realized that most of the time, even in tournaments, I don't actually think or analyze. The thinking activity drastically increases during semeai or life and death issues. Most of the moves are played by intuition. Hardly ever do I build a decision tree to pick out the most successful branch: I rather spot one move, then ponder a few others before eventually playing the first one. In semeai or life and death I continue to explore all valid candidates. In this sector I seem to be able to make a sound decision tree. In fuseki and in general when a lot of options are available, I intuitively pick three candidates - not more. I analyze each one on its turn and evaluate the result. The one that leads to the best result is chosen. All very well, but how do I prevent the tree with three branches from branching exponentially ? Well, for the continuation I pick the most natural answer for each player (the one I would pick before). Since this is not semeai or life and death, there is no reason to consider exceptional moves. The alternative for the most natural answer can as well be tenuki, which makes for about 300! continuations. One of the big advantages is that this prevents me from being caught up in the heat of the game. Unfortunately I haven't yet managed to maintain this new habit, and often I get into careless intuitive (bad) play. So I welcome this occasion offered by BlueWyvern and will give three candidates each time plus the reason why I chose one of them. Oh, and about early fuseki: with White I play hoshi and with Black komoku, just for the heck of it and because the level at which I'm playing assures me that none of the first four moves will be the losing move: moves 57, 92 and 113 will be. Fellow Belgian Librarians, had you noticed that at the Ch'ips ? BlueWyvern: Thanks again for helping out. White 2: as promised, on hoshi. As promised, three alternatives: which of the three hoshi in the open corners? 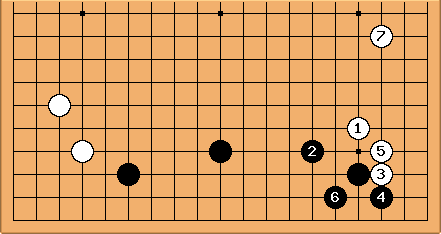 I like to invite Black for a diagonal fuseki since I like multi-group games more than moyo games. So lower right or upper left. Lower right would want to develop into a direction where Black is low/stable/strong. So upper left it is. 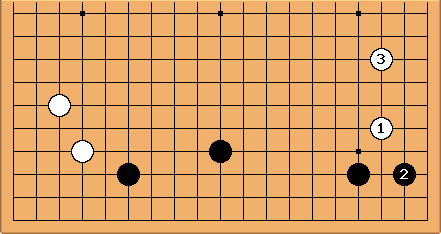 White 4: Three candidates: a play in the open corner is most natural. 1) If hoshi, both the possible shimari face a hoshi and White will of course extend when Black makes one. So we can expect kakari instead. In any case, it doesn't look like we're going to have a fuseki, biased to one area, like the Chinese fuseki my friend Stefan so often employs against me, to my distaste. So, lower left hoshi leaves me with a good feeling. 2) Neither of the lower left komoku give me the same feeling and are discarded. The feeling matters more than the technical advantage. 3) I thought a moment about Diagram 1. Either White loses sente and Black plays in the lower left: I don't like to be concentrated in one area. 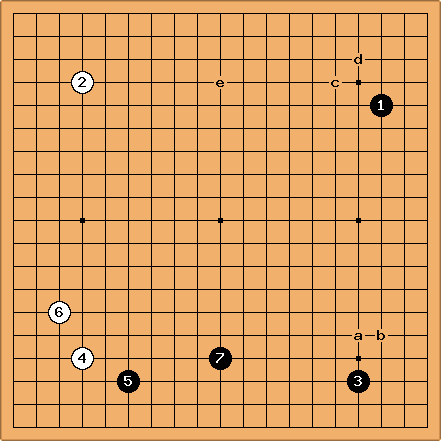 Or White has to abandon 4 and leave it as a forcing exchange to play in the lower left myself. Nothing tells me that an invasion at 5 or sansan wouldn't have been better. No reason to deprive myself of those options. White 6: What I usually do is first answer the question "If I answer locally, where would it be ?" The three most popular answers to the keima kakari nowadays are ikken tobi, keima and the small low pincer. I strip out the pincer because the marked stone is low but I am prepared to reconsider it if the rest is unsatisfactory. Diagram 2 shows the visualisation of the pincer's result. Now that I see it, I realize it reduces the development of Black's shimari at a and thus its value. I see no preference between keima and ikken tobi. So in order to determine my choice, I want to know what I will do if Black approaches my upper left corner. If I pincer there and mirror Diagram 2, an ikken tobi in the lower left will be hurt by Black's spear coming from the north. Let's imagine the keima then (Diagram 3). If Black 2-White 3 I would play Black 4 to make good balance with the marked stone. 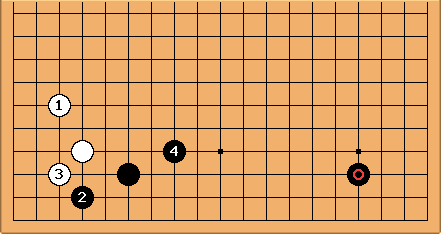 So for White to play as in Diagram 4 in order to keep Black low, is feasible. Also, this will lead to fighting, which I prefer. Finally, I see no reason for tenuki and give Black the upper hand in this part of the board. The keima looks like giving me the most flexibility. White 6: keima. Note: I'm putting much more thought into this fuseki than usual. 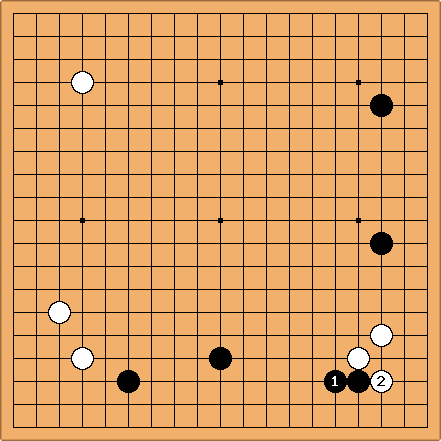 White 8: I acknowledge that Black is going for a moyo in the south eastern half. Basically there are two ways to react: build a moyo in the other half or preventing Black's moyo. Drawback of the first strategy is that Black is likely to perfect his moyo to the detriment of White's. Drawback of the other one is that White comes into the zone where Black is strong. In addition to style, my decision is also influenced by my previous choice. Having played low with 6 makes it less interesting to build. I will choose between a, b - which aim at preventing the moyo - and c which aims rather at reducing it while building something oneself. I exclude d immediately, because Black will press me down immediately and build a huge moyo. Also d is not really the best point for Black 'either', as long as I have e available. 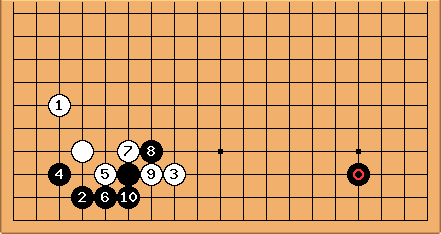 After this joseki, Black will probably make a shimari in the lower right and White can take tedomari at the left. White 1 high kakari gives many options to Black. For the moment I dislike this pattern because it pops up almost every game. The low kakari, very common in Shusaku's time, is almost never played nowadays. Not by professionals, who have their reason for preferring high kakari. And not by amateurs, because they imitate the pros. Myself I have a slight idea why not to come in low in the low Chinese fuseki but this is the small Chinese (or isn't it - I don't know much about fuseki). The problem here is that Black can just play simple answers and get tedomari. Still I am interested in his reply. So my argument here is not very "reasonal". Pure gusto makes me play White 8: low kakari. I keep in mind that I can still consider it kikashi and return to the upper right corner. Most probably this is where my not understanding Go comes to the surface. After 6, White can take sente to play at the top. The points a and b are miai. However, Black 6 feels slightly overconcentrated: maybe he can play first at the top himself. Black 8 at 1. Black can also play this way to get sente. 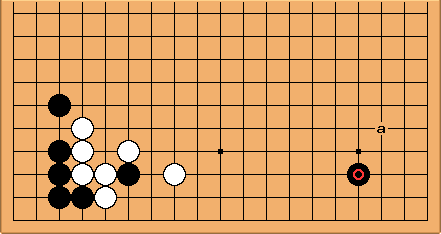 I don't know if White 7-9 are better at a-b, but I think the bottom stones are far away enough from my thick position and the right side stone is more vulnerable. ... in this position, White 3 may be better here, and White reduces the moyo convincingly in sente.